Buying the Bayou :: Show Information :: RabbitTV GO! BUYING THE BAYOU proves the real estate market in the south is bursting with properties as extraordinary as its people and culture. 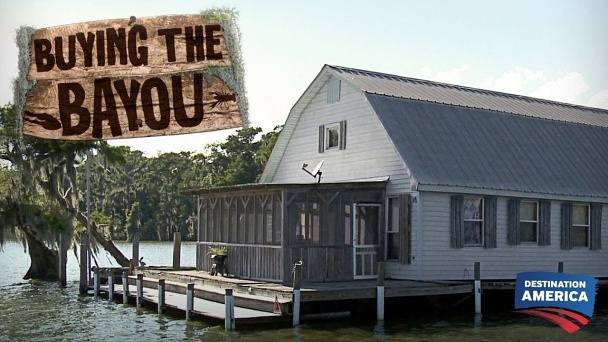 Transporting viewers deep into the swamps, marshes, and waterways of America’s Gulf Coast to see houses that simply can’t be found anywhere else in the country, each episode combines Cajun real estate agents and quirky clients to create irresistible television gumbo. Watch people go head-over-heels for the swampfront shack of their dreams – whether it’s an alligator farm or converted fishing boat. The clients explore three properties from top to bottom while risking run-ins with gators and nutria. After weighing the pros and cons of each home, they’ll decide which property meets their needs, budgets, and Bayou dreams.